Jason Kidd’s story is a lesson in patience, proof that good things truly do come to those who wait. Jason embodied the qualities of a Hall of Fame player throughout the course of his NBA career. He was fiercely competitive; he was devoted to playing perfect team basketball; he was a tireless worker and student of the game, meticulously professional in everything he did on the court. Every team he ever played for was dramatically more successful after his arrival, and dramatically less so after his departure. But for 16 years on the court, J-Kidd’s work went without the ultimate prize: a NBA title. It wasn’t for lack of trying. Jason had led his team to the postseason in 14 of those 16 years. He twice took a Nets team that was considered an also-ran before his arrival to the NBA Finals, coming up just games short of a ring. “With my dad, (winning a championship) was the No. 1 thing. Talking with him when I was younger, or seeing him on the road while playing in the NBA, I always told him we were going to win a championship here soon. I think he agreed. I also think he was willing to be honest about the fact that there are some better teams out there than you. In 2011, it finally happened for Jason Kidd. No. 2 and the Mavericks put together one of the more memorable runs in NBA playoff history. Dallas dug deep to beat the Blazers, then swept the defending champion Lakers. They battled at the OK corral and finally fanned the flames of the Heat to become the last team standing. All Jason’s hard work paid off when on June 12, 2011 he hoisted the Larry O’Brien NBA championship trophy, the ultimate piece of excellence in a surefire Hall-of-Fame career. Certainly Jason’s 19-year NBA journey is a example of the value of patience and hard work, of leadership and dignity. But beyond all his attributes, beyond the intangibles that Jason Kidd has exhibited for thousands of hardwood days, he is simply a uniquely talented athlete, blessed with once-in-a-generation court vision that borders on extrasensory perception. From his youth to the present, Jason has left coaches, teammates, and onlookers awestruck, making the on-court impossible possible, all the while evolving into one of the statesmen and leaders of today’s professional game. However, it wasn’t just kids who looked up to Jason, but players too. So it seemed fitting that just weeks after announcing his retirement from the league after 19 seasons as a player, Jason was back in the game, taking on one of the biggest challenges of his life as a head coach. Now, nearly two decades after he first captured their imagination, the basketball world is still looking on in wonder at 10-time All-Star, NBA superstar, first ballot hall-of famer, Olympic champion, NBA champion and now NBA head coach, Jason Kidd. Born in San Francisco, California, on March 23, 1973, to parents Steve and Anne, Jason Frederick Kidd played soccer – not basketball – until he was in the second grade. Shortly after he began playing competitive basketball, however, Jason was mesmerizing anyone who happened to catch a glimpse of him on the court. Another of Jason’s admirers was none other than Gary Payton. Five years Jason’s senior, Payton hailed from the same Oakland neighborhood, and took the young prodigy under his wing. Emulating Payton and Magic Johnson – his childhood idol – Jason’s legend grew. By the time Jason reached his junior year at St. Joseph High School in Alameda, California, he was a national sensation. He took St. Joseph to two straight state championships and accumulated a host of honors in his senior year: the Naismith Award as nation’s top high school player as a senior, averaging 25.0 points, 10.0 assists, 7.0 rebounds and 7.0 steals, and Parade and USA Today High School Player of the Year. Cal basketball fans could not have been happier. The year before Jason arrived, the Bears finished 10-18, ninth in the Pacific-10 Conference. At the end of his freshman season, the National Freshman of the Year led California to a 21-9 record – second in the Pac-10 – and the NCAA tournament for only the second time in 30 years. The Bears reached the Sweet Sixteen thanks to two game-winning shots by Jason – the first in Cal’s opening round game against LSU, the second against two-time defending champion Duke. What about the scrambling layup off his own deflected pass to beat Duke? A year later, in his second and last collegiate season, Jason led Cal back to the NCAA tournament – at that point, the first back-to-back trips since the 1958-59 seasons. He became the first sophomore in the history of the Pac-10 to be named its Player of the Year, and broke Kevin Johnson’s records for assists and steals – which he accumulated in four years at California – in only two seasons. Jason was the second overall pick in the 1994 NBA draft, chosen after Purdue’s Glenn Robinson and before Duke’s Grant Hill by the Dallas Mavericks. His impact was immediate. Dallas was 13-69 in the season before Jason arrived; a year later, the Mavericks finished 36-46. The league, fans and media took notice. At the end of the season, Jason and Hill shared Rookie of the Year honors. Hill had TV commercials before he ever played an NBA game. Unlike Kidd, he was born into a wealthy family. And, with two months left in the season, he seemed headed toward a runaway Rookie of the Year victory based on popularity alone. But voters noted Kidd’s late-season surge, as he led Dallas to a 23-game turnaround from last season. Kidd and Hill each received 43 first-place votes. Milwaukee forward Glenn Robinson finished third with 15 first-place votes. 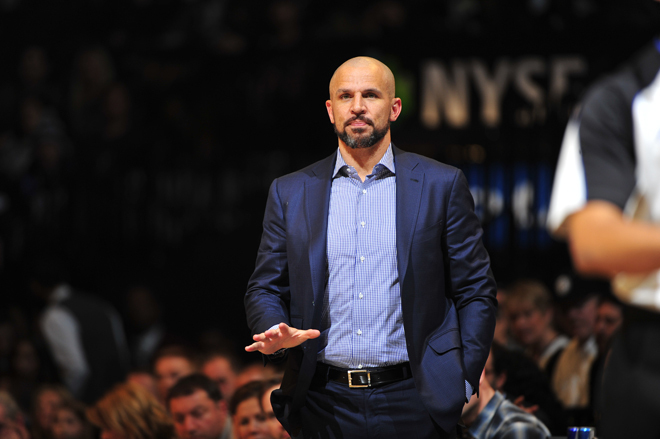 Now, though, by winning the most prestigious post-season award ever won by a Maverick, Kidd is about to become the most nationally visible Maverick ever. Jason would remain in Dallas for only one and a half more seasons, however. On December 26, 1996, in a shocking move, the Mavericks traded Jason, Tony Dumas and Loren Meyer to the Phoenix Suns for Sam Cassell, Michael Finley, and A.C. Green. Dallas finished that season 24-58. Phoenix finished 40-42 and reached the postseason. A year after joining the Phoenix Suns, Jason was doing what he had done for every other team he had played for – revitalizing it. Phoenix finished the season 56-26, its best record in three years. The Suns would make the playoffs in every one of Jason’s five seasons with the franchise, reaching the conference semifinals in 1999-2000, where they fell 4-1 to the eventual league champions, the Los Angeles Lakers. At the same time, Jason continued to accumulate individual honors, making the NBA All-Star team for the second and third time (1998, 2000) and being named to the NBA All-Defensive team every season. In every year with Phoenix, he ranked in the league’s top 10 players in steals. During the summer of 2000, Jason also enjoyed playing with Team USA in Sydney, helping to bring America its last Olympic gold medal in basketball. One of three team captains, Jason averaged six points and five rebounds, shot 51.6% from the field and 50% from three-point range, and led the squad in assists (4.4) and steals (1.1) per game. Despite all his success both in the NBA and as an Olympian, for the second time in his career, Jason was the center of another sudden blockbuster trade. During the summer of 2001, Jason was sent to the New Jersey Nets for Stephon Marbury. Shortly after joining the Nets, Jason made a bold prediction: New Jersey, winners of 26 games in 2000-01, would win at least 40 games. “Hopefully, I haven’t put too much pressure on Rod Thorn and Byron Scott,” he said. Jason’s prediction fell woefully short of what New Jersey would actually accomplish in the coming year. The basketball world saw precisely how misguided the Kidd-Marbury trade was when Phoenix played New Jersey on December 6, 2001. The Nets won, 106-87, and they did it on the back of 13 assists from their new point guard. Thorn spoke glowingly of his superstar’s abilities. Individually, it was one of the most phenomenal seasons of Jason’s career. He finished with a league-high 171 steals, ranked an NBA fourth-best in assists per game, and finished second to Tim Duncan in the MVP race. Still, even Jason was amazed by what New Jersey had accomplished. What the Suns were doing with Kidd, in their defense, was losing in the first round, four times in five years. The top-heavy Western Conference deserves more of the blame for that than Kidd does. Still, not even the comparative weakness of the East can dilute the feat of overcoming the Nets’ wretched legacy. Any doubts about whether Kidd could translate his gifts into a championship, or anything close, are gone. This has been a transformation and a validation. New Jersey would lose to Los Angeles in five games, but Jason status as one the greatest point guards and floor leaders in NBA history was firmly established – particularly when he led the Nets back to the NBA Finals a year later. Unfortunately, Jason and New Jersey fell again, 4-2, to the San Antonio Spurs. Jason would lead New Jersey to the playoffs in every year that followed, reaching the conference semi-finals three more times. He would also be named to the NBA’s All-Defensive First or Second Team for six straight seasons. In February of 2008, Jason and Malik Allen were traded to the Dallas Mavericks for Devin Harris, Trenton Hassell, Keith Van Horn, DeSagana Diop and Maurice Ager. Unlike the departure from his previous two franchises, Jason left New Jersey on amicable terms, with both parties ready for a change. Kidd has been handed the quarterback role by a franchise that blew a 2-0 lead in the 2006 NBA Finals then suffered a historic first-round ouster after winning 67 games last season. This franchise’s expectation level and Kidd’s charge could not be clearer. In Dallas, they believed from the start. Jason joined perennial All-Star Dirk Nowitzki on a loaded Mavericks roster and expectations were sky high from the jump. So high, that they seemed almost unattainable. The Mavs consistently won 50 games per year, but when the playoffs came along, things went awry. Three years into Jason’s return to Big D, the Mavs had advanced out of the first round of the postseason just once. Even in that season, 2008-2009 when they reached the Western semifinals, they fell in just five games to Denver. But Dallas stayed the course and owner Mark Cuban remained committed to the cause adding pieces to make the team more complete. Meanwhile, Jason added something to his game as well. Late during his time in New Jersey, J-Kidd began working with a shooting coach to try to attain an effective three-point jump shot. He had noticed teams sagging off him when he had the ball and understood that in order to keep defenses honest, he had to add to his repertoire. In his first half season back in Dallas (29 games), J-Kidd shot 46 percent from deep. He made 40 percent of his treys the following year and then a career high 42.5 in 2009-2010. Jason thanks shooting coach Bob Thate for helping him a new facet to extend his career. In 2011, Jason passed Dale Ellis and Peja Stojakovic to move into third on the NBA’s all-time list of three-pointers made. The Mavs pieced together another 50-win season in 2011 and entered the postseason as the three-seed in the West. Many pundits predicted another first round exit, but to Jason, from the start of the year, the aura around the team felt different. They overcame adversity at every turn, dealing with injuries to top-scorers Dirk Nowitzki and Caron Butler in the regular season and Jason believes that experience prepared them to face more obstacles in the postseason. In the first round of the playoffs, the Mavs took a 2-0 series lead, only to surrender it over the next two in Portland. After Dallas blew a 24-point lead in Game 4, the series was tied at two. The Mavs regrouped and won the next two games to advance to the next round and a showdown with the Los Angeles Lakers. In that series, Jason took on the task of guarding Lakers star Kobe Bryant down the stretch in games and managed to limit the LA scorer’s options. But Jason did slow Kobe and all at once the Lakers’ three-year run came to a halt as J-Kidd and the Mavs swept LA out of the playoffs. Dallas moved on to the West Finals where they would face a young Oklahoma City Thunder team. After splitting the first two games, the Mavs won the next three to advance to the NBA Finals. Jason came up big in games three and four, including a tie-breaking triple in overtime, which sealed a game four win. The Mavericks advanced to the Finals for the first time since 2006 to face LeBron James, Dwayne Wade and the Miami Heat. The series was a slugfest from the outset with Miami taking game one. The Heat seemed well on their way to taking a 2-0 lead in the series when they went up by 15 points in the fourth quarter of Game 2. But the resilient Mavs found another way to comeback and turned the series around. Following the championship run, Jason made it clear that he has no plans to hang up his sneakers and the Mavericks were happy to have him back in the chase for another championship. “Jason Kidd’s DNA is all over this thing,” coach Carlisle said of the title. “You don’t see some of the gaudy statistics in terms of points scored or things like that, but the way he has facilitated our team on the court with his leadership ability, his knowledge of our team, the example he sets by playing with a certain level of intensity…on the other hand he’s extremely cool under pressure. Jason spent the following year in Dallas, where a run at back-to-back titles ended abruptly in a four-game first-round sweep at the hands of the same Oklahoma City team the Mavs had beaten in five in the Western Conference Finals one-year earlier. After the season, J-Kidd had to decide where to continue his long, illustrious NBA career. While Jason mulled a contract offer from Dallas to return to the Mavs, he received an offer from the New York Knicks he just couldn’t pass up. Jason’s decision to sign with the Knicks came as a surprise to the sports world, but Jason joined New York because he believed they offered the best chance for him to add another NBA championship to his legacy. In Jason’s lone year with the Knicks, he helped the franchise reach new heights while instilling some of his leadership principles in his teammates. With J-Kidd running the point as both a starter and a reserve, New York won 50 games for the first time since the 1999-2000 season and their first Atlantic Division crown since the 1993-94 season. Perhaps Jason’s most memorable moment of his only season with the Knicks came at the arena he will be calling home as a coach. In a tightly contested crosstown battle between the Knicks and Nets, Jason, who had missed the first meeting between two teams — a Nets win — due to injury, hit a three-pointer with 24 seconds left to break a 97-97 tie and lead his Knicks to a huge win just over a month into the season. However, as coach Mike Woodson noted, the most valuable thing Jason brought to the Knicks was not something that could be quantified statistically. “Veteran leadership on and off the court was a huge factor for our team that recorded 54 victories and an Atlantic Division crown,” Knicks coach Mike Woodson said. “Jason provided an incredible voice inside our locker room and I considered it an honor to say I coached him. In the postseason, the Knicks got over another hurdle that had long haunted the franchise, win New York’s first playoff series win since 2000, a four games to two victory over the Boston Celtics. The Knicks fell short of their goal of a championship in the next round, losing the Eastern Conference Semifinals in six games to the Indiana Pacers. Jason took a few weeks after that loss to think and decided that after 19 years and 1,549 games in the NBA, it was time to hang it up. He ended a surefire Hall of Fame career sixth all-time in regular season games played at 1,391, second all-time in assists and steals at 12,091 and 2,684 respectively, and third all-time in three-pointers made at 1,988. And despite scoring being secondary among his tasks, he’s well into the Top 100 in all-time NBA scorers at 71st with 17,529 points. Among the accolades he earned, Jason was a 10-time NBA All-Star, a five-time First Team All-NBA selection and a four-time First Team All-Defense selection. Though his playing days were over, Jason had not lost the itch for basketball. After announcing his retirement, his agent Jeff Schwartz asked him what was next. The two discussed his options, and when the prospect of coaching came up, it was noted that the Nets — perhaps the team Jason had helped the most in his Hall of Fame career — were looking for a new head man. He interviewed for the job and just nine days after announcing his retirement as a player, Jason Kidd was named the 18th coach of the Nets. Jason acknowledged that jumping into a new role without experience wouldn’t be easy, but said it was a task he’d meet head on. Jason’s career as a coach got off to a rocky start as a Nets team that was attempting to integrate several new pieces and gel in a short period of time, had trouble finding the cohesiveness necessary to compete at a high level. The Nets lost 21 of their first 31 games and came perilously close to falling out of contention. But through it all, Jason’s faith in his team and himself never wavered. Reflecting on the season after it was over, J-Kidd noted that Brooklyn’s rough start was one of the biggest tests of his career. As if they’d hit the rest button on the season, things got better for Brooklyn just as a new calendar year began on January 2. In a sign of things to come, Coach Kidd’s squad showed resilience and heart in a come-from-behind 95-93 victory over the Thunder in Oklahoma City, capped by a buzzer beater from star swingman Joe Johnson. With his players finally healthy, J-Kidd showed his true chops as a coach in January, coaching the Nets to wins in 10 of their 13 games over the course of the month. 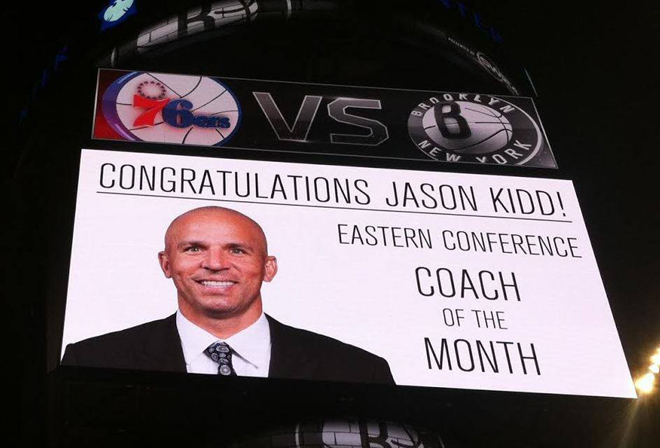 For his efforts, Jason was awarded Coach of the Month by the NBA. Upon learning of the recognition. 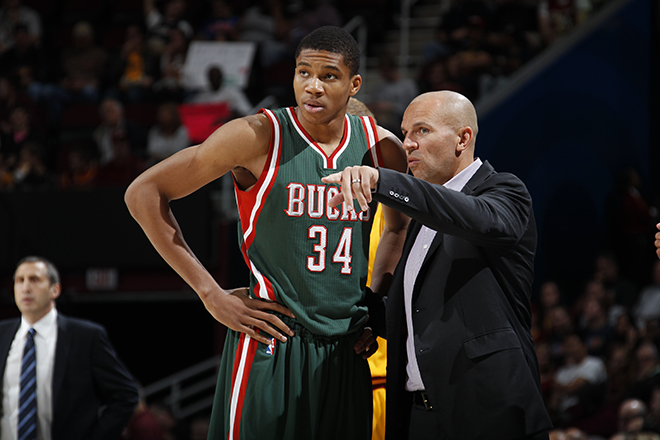 Coach Kidd modestly downplayed his role in the team’s success. “I think it’s a great honor for guys in that locker room because they’ve been playing at a high level,” he said of the award. The Nets continued to roll in February and climbed within striking of distance of the .500 mark and playoff contention as the calendar turned to March. It was in the third month of the new year that the Nets were perhaps at their peak. Brooklyn went a 12-4 record in March, including a perfect mark of 9-0 at the Barclays Center, setting a new franchise best mark for consecutive wins at home that eventually stopped at 15 in early April. Brooklyn was strong on the road in March as well, highlighted by a 107-104 overtime victory on March 27 — Jason’s birthday — in his Dallas homecoming. 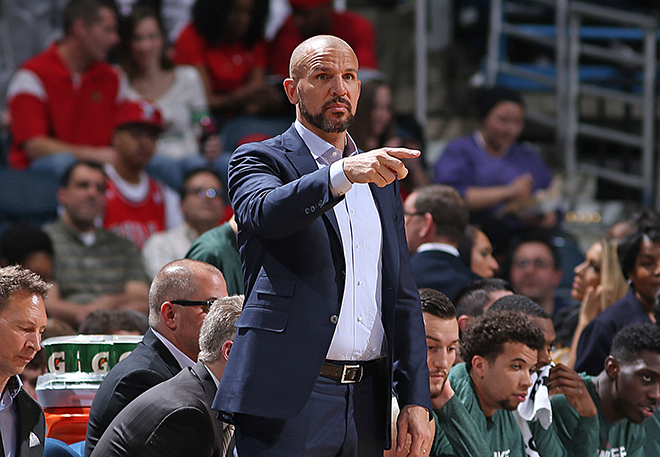 Afterward, Coach Kidd lauded his team for their effort to fight back and beat the Mavs. “We found ourselves winning a ballgame that maybe in 2013 we would have lost,” he said. At the end of March, the NBA once again recognized Jason with the Coach of the Month accolade for his continued success. He became just the second rookie coach in NBA history to win the award twice in one season, joining Chicago’s Tom Thibodeau. On the same day he received that honor, Coach Kidd’s team gave him a much more meaningful reward with a 105-96 win over the Houston Rockets at the Barclays Center that clinched Brooklyn’s spot in the postseason. Brooklyn ended up as the sixth seed in the Eastern Conference and drew a first round matchup with Atlantic Division Champion Toronto Raptors. 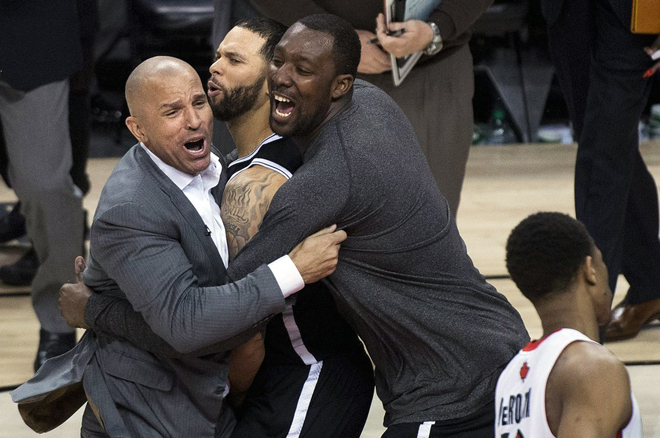 The Nets used the playoff experience held by Coach Kidd and veterans like Paul Pierce and Kevin Garnett to their advantage in what ended up being a knock-down, drag-out seven game battle with the Raptors. Led by Pierce’s late-game heroics and some lock down defense, they stole Game 1 at the Air Canada Centre in Toronto, 87-84, a critical way to start the series, marking Jason’s first playoff win as a coach. The Raptors earned a split at home with a Game 2 win, and although the Nets won Game 3 on their home floor, Toronto stole home court advantage back with a Game 4 win in Brooklyn, sending the series back to Toronto tied 2-2. The Raptors made the most of their hometown favor by winning a 115-113 Game 5 thriller that suddenly pushed Brooklyn to the brink of elimination. 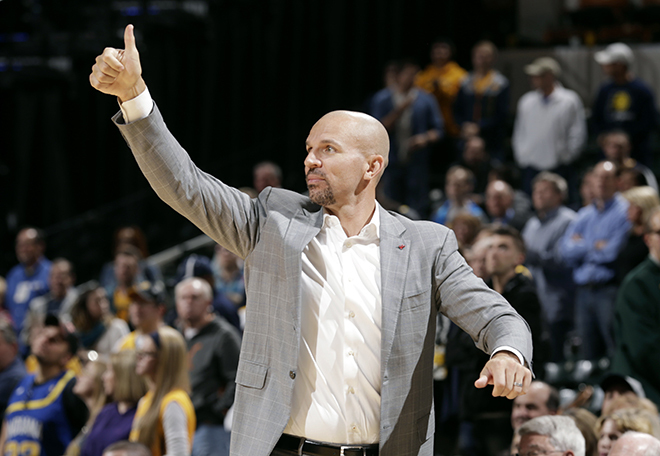 Still there was no panic in Coach Kidd’s style and his team’s performance over the next two games reflected that. In Game 6, Jason’s squad dug deep and dismantled the Raptors 97-83 in Brooklyn to even the series and force a Game 7 in Toronto. Two days later, Jason became the first rookie head coach to win a Game 7 on the road, when his Nets outlasted the Raptors 104-103. The win set up a second round matchup against the two-time defending NBA champion Miami Heat, and Brooklyn’s season came to an abrupt end as they picked up just one win over the Heat in the series and were ousted in five. Still, Jason reflected on the season with no regrets, able to look back and take pride in the way he and his team overcame adversity to prosper in his rookie year as a coach. 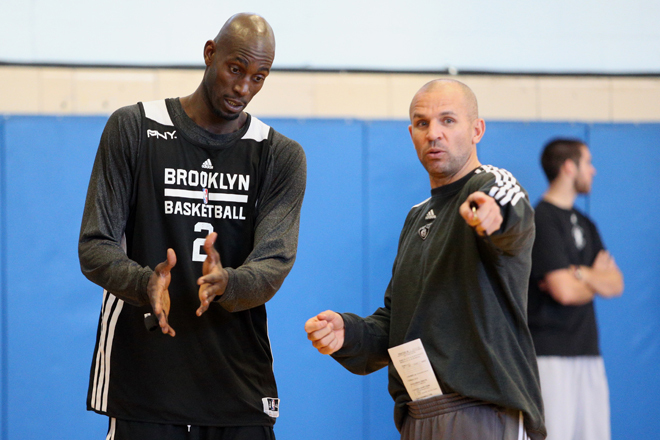 The 2014-15 season would prove to be Jason’s only one as coach of the Nets. A sequence of offseason events in Brooklyn led the Nets to negotiate a trade of Coach Kidd’s rights to the Milwaukee Bucks. On July 2, 2014 Jason was introduced as the 14th head coach of the Milwaukee Bucks, a franchise with a storied history in need of help to rebuild and return to the glory days of their past success. 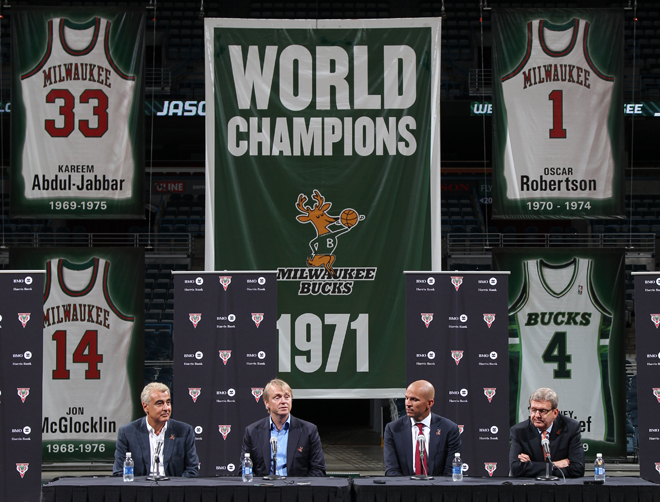 At his introductory press conference, Jason expressed gratitude towards the Milwaukee organization and his plans to make the Bucks a competitive NBA franchise. Jason knows he will have his work cut out for him, as he attempts to become the fifth coach in Milwaukee history to earn and maintain a winning record, and he’ll be doing so with a much younger team in a much smaller market with different resources than he left in Brooklyn. But Jason made a point to note that what the game of basketball boils down to has little to do with the size of the market they play in. The Milwaukee Bucks were an instant success in J-Kidd’s first year at the helm. Milwaukee stumbled to the NBA’s worst record: 15-67 the year before Jason arrived, but he brought them straight to the playoffs. The Bucks turned it right around, going 41-41 to earn the No. 6 seed in the Eastern Conference. The Bucks faced a tough first-round matchup against an experienced Chicago Bulls squad and went down 3-0. But with things looking grim, J-Kidd’s group battled, winning back-to-back games, including one at Chicago’s United Center to bring the series back to 3-2. Unfortunately, the Bulls took Game 6, ending Milwaukee’s run. But overall, Jason saw Year 1 as a tremendous success. 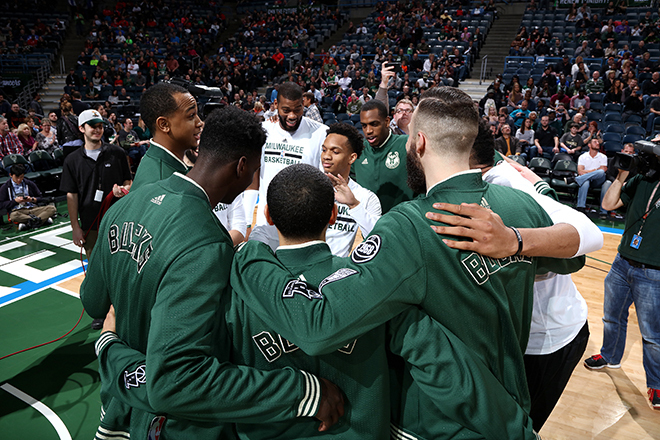 The Bucks were competitive all year long, playing to a 10-7 record to open the year. That early stretch included some big wins over the Oklahoma City Thunder, Memphis Grizzlies and Miami Heat. Jabari Parker was out to a fantastic start for his career after being drafted No. 2 overall, averaging more than 12 points and five rebounds per game—but in his 25th professional outing, he tore his ACL, marking an early end to his rookie campaign. 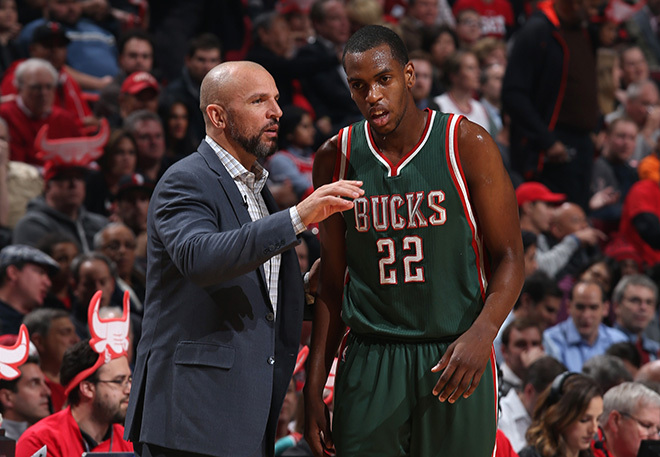 With Jabari out, Khris Middleton came into his own and established himself as a leader and go-to scorer on the wing. He averaged a career-high 13.4 points per game, racking up several game-winning and clutch shots late for the Bucks. The Bucks were outstanding in late January and early February. 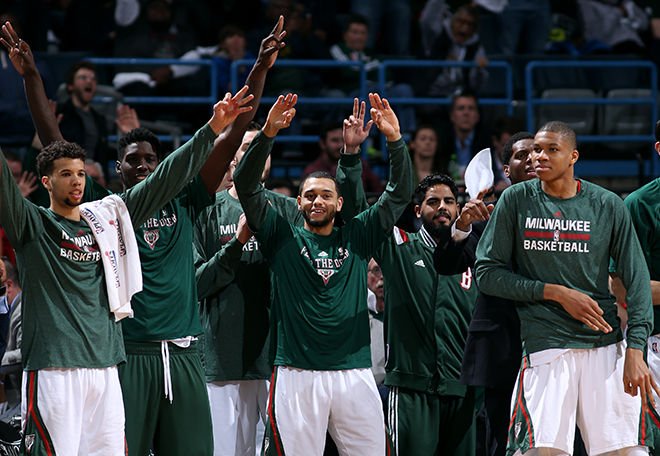 From Jan. 24 to Feb. 20, Milwaukee went 10-2, roaring to a 31-23 record. Late in the year, their youth showed, as they stumbled through March, falling below .500 for the first time since December. When their playoff lives were in jeopardy—they battled back. The Bucks won back-to-back games over the Heat and the Indiana Pacers, and again over the Bulls and the Boston Celtics. Finally, the Bucks won three out of their last four to finish the season right at .500. The playoffs brought some thrilling action. The Bucks had beaten the Bulls just once in four meetings during the regular season, and they put up a tremendous fight in the postseason. After a couple of tough losses in Chicago, the series returned to Milwaukee, where the Bucks dropped a double-overtime heartbreaker, putting them on the brink of elimination. But Jason’s squad kept fighting. The Bucks claimed Game 4 on a buzzer-beating layup by Jerryd Bayless. Then Michael Carter-Williams and Middleton combined for 43 points to steal another win in Game 5 on the road. Unfortunately, the Bucks were left looking forward to the future after a rough Game 6, as the Bulls cruised to a win and sent Milwaukee home for the season. But despite the exit from the playoffs, Jason remained optimistic. The Milwaukee Bucks made changes during the 2015 offseason, bringing a new logo, color scheme and look to the franchise. On the court, the young Bucks got younger. They added big man Greg Monroe to the mix, but they also lost a few key veterans off their bench. Bench play was a major strength for the Bucks in 2014-15, but in 2015-16, depth was an issue—also much thanks to injuries. Michael Carter-Williams, Greivis Vasquez, Steve Novak, O.J. Mayo, Jerryd Bayless and John Henson were all out for extended periods of time—and only four players (Antetokounmpo, Monroe, Middleton and Parker) played more than 70 games. As a result, the Bucks took a step back on paper, finishing the season at 33-49 and out of the playoff conversation. But Jason still saw plenty of progress out of his young group. The big four who were able to stay healthy on the court for 70-plus games all had outstanding individual seasons. Giannis Antetokounmpo averaged nearly 17 points and 7.7 rebounds per game and was fourth in the league with five triple-doubles. Parker averaged just over 14 points a game in his first full NBA season. The two players were consistently making highlight reel plays, rocking the rim and getting teammates involved. Shooting guard Khris Middleton also provided a consistent spark for the Bucks offensively, leading his team with 18 points per game. Numerous injuries forced Jason to swap his lineup regularly. But whether Greg Monroe was starting or coming off the bench, the new Buck always made an impact. The fifth year forward averaged 15.3 points per game and 8.8 rebounds. While the young Bucks went through some growing pains, Jason had some physical pain to fight through as well. 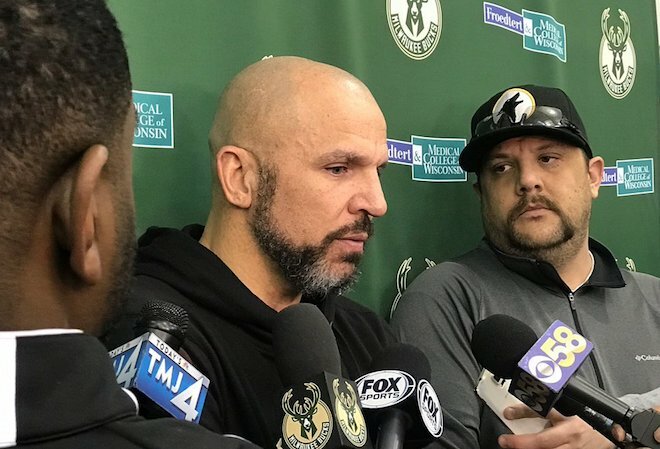 On Dec. 21, Coach Kidd underwent a hip resurfacing operation to repair an injury from his playing days. “When that happened, pain became the norm. I tried to withstand it, but at a certain point, it just became too much. Once it became a constant and there was no break from it, I couldn’t sleep. There wasn’t any good position to sleep in. That’s when I knew that we needed to address it as soon as possible. With a shiny new hip, Jason returned to the court in January to lead the Bucks once again. Unfortunately, through all the injuries—to coach and player–the Bucks never had the continuity they needed to make a second straight march to the playoffs. But despite a difficult year, things were looking up for the Bucks going into Jason’s third year. “Physically, I feel great. The surgery I had during the season has helped me feel a million times better. It was something that needed to be done when it was done, and Dr. Su did a wonderful job with it. The rehab has been great, so I have had no problems being myself again. With that behind me, I’m ready to continue working toward getting this team better for next year. The Milwaukee Bucks went into the 2016 offseason needing to retool their roster after a disappointing season. This started, however, by locking up their main guy in their first big move of the summer when they signed up and coming star Giannis Antetokounmpo to a four-year, $100M extension. The Bucks sought more athletic wing depth and dealt former Rookie of the Year Michael Carter-Williams to the Chicago Bulls for Tony Snell. The move paid off for the Bucks as Snell played in 80 games and averaged 8.5 points, 3.1 rebounds and 1.2 assists while shooting 45.5% from the floor and 40.6% from distance. In addition, Snell added a great defensive piece for the Bucks to complement Antetokounmpo on the wing. In addition to adding Snell, Milwaukee ended up drafting the Rookie of the Year winner, Malcolm Brogdon, in the second round of the NBA draft. Brogdon averaged 10.2 points, 4.2 assists and 2.8 rebounds and shot 45.7% from the floor and 40.4% from distance while starting 28 games. In addition to their new players, the Bucks got a breakout year from Giannis Antetokounmpo at age 22. Giannis complied statistics across the board, averaging 22.9 points, 8.8 rebounds, 5.4 assists, 1.9 blocks and 1.6 steals – leading the team in all five categories. While there were positives across the roster, there was another scary moment in the development of Jabari Parker when he suffered his second left ACL tear in the past three seasons in February. Coach Kidd confirmed the suspicions and said Parker was ruled out for 12 months, ending a strong season for the youngster. Despite that fact, the Bucks made it back to the postseason as the Eastern Conference’s sixth seed with a record of 42-40. In the postseason, Milwaukee faced the Toronto Raptors and stole Game 1 on the road with a dominant performance, winning 97-83. After splitting the first two in Toronto, the Bucks protected home court with a big win in Game 3, 104-77, to take a 2-1 series lead. The Bucks were unable to get another game from the veteran Raptors as they ripped off three straight to advance to the second round, but the growth was there for the Bucks as they entered the offseason. In the 2017 offseason, Milwaukee used their first round selection in the NBA draft to pick D.J. Wilson from the University of Michigan. The selection stayed true to Milwaukee’s love of long, athletic prospects as Wilson is 6’10”. Without Jabari Parker to start the season, the Bucks were shorthanded on talent and quickly decided they needed to make a move. On November 7, Milwaukee agreed to trade Greg Monroe and two protected draft picks to the Phoenix Suns for Eric Bledsoe. “We’re excited, Eric’s excited,” Kidd said. Bledsoe immediately helped ease the ball handling burden on Giannis Antetokounmpo and delivered a four-game winning streak upon his arrival. After a hot start with Bledsoe, the Bucks stayed consistently around the .500 mark throughout the rest of the calendar year and into January 2018. With expectations of the team taking the next step this season, Milwaukee’s front office was disappointed in the start. On January 22, 2018 after three-and-a-half years at the helm of the Bucks, Jason was relieved of his head coaching duties. J-Kidd thanked the Milwaukee franchise for the opportunity as he heads forth into the next chapter of his career. On Sept. 7 in Springfield, Mass. 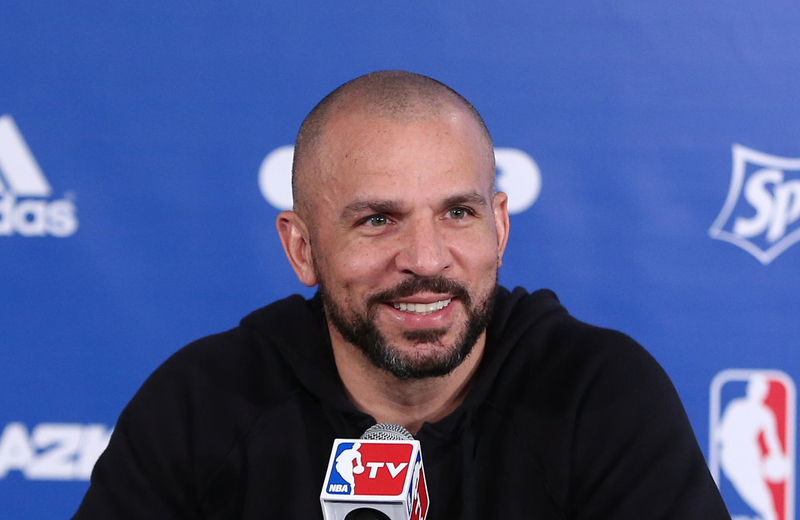 Kidd was inducted to the Basketball Hall of Fame alongside Steve Nash, Grant Hill and Maurice Cheeks in a deep 2018 class. Gary Payton served as Kidd’s presenter, their ties going back to the hard courts of the Bay Area. J-Kidd praised Payton as one of the guys that helped show Kidd the way to the top, and he thanked Payton for inspiring him to be great. The night was a great time to reflect on a legendary NBA career, one in which Kidd earned 10 All-Star selections, co-Rookie of the Year honors shared with Grant Hill, an NBA title with the Dallas Mavericks and Dirk Nowitzki and two Olympic gold medals. The Hall of Fame induction ceremony, alongside two of the other greatest competitors in Kidd’s era was a fitting way to wrap up a career full of amazing moments.